California GOP gubernatorial candidate Neel Kashkari, fresh off a win in the state primary on Tuesday, challenged Governor Jerry Brown to at least ten debates in the run-up to November’s general election, according to the Los Angeles Times. 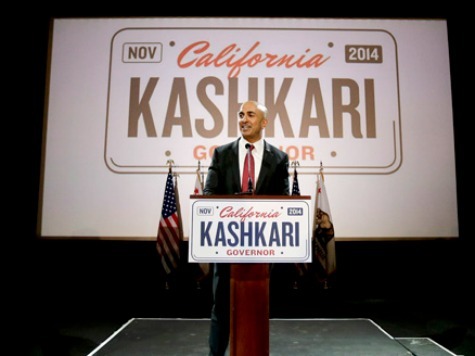 Kashkari issued his challenge while speaking on a radio show on KFMB-AM San Diego. He apparently wants Brown to have a taste of his own medicine; in 2010’s gubernatorial race, Brown challenged Republican nominee Meg Whitman to ten debates, also shortly after the primary ended. I guarantee you he is going to duck and hide underneath his desk and avoid trying to debate me. But four years ago, he told Meg Whitman to debate him 10 times. … They owed it to the people of California to have the issues put on the table. So all right, governor, you challenged Meg Whitman to 10 debates, let’s have 10 right now. You want to do 20, I’ll do 20. You want to do it in the Capitol, I’ll do it in the Capitol. Name the time, name the location. We’re going to talk about the real issues facing California families. According to the Times, political observers doubt Brown will debate Kashkari because of his huge advantage going into November’s general election. Kashkari will apparently need all the help he can get in that contest.